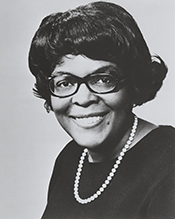 Elected to 12 consecutive terms in the U.S. House of Representatives, Cardiss Collins ranks as one of the longest–serving minority women in the history of Congress. Succeeding her late husband, Representative George Collins, after his death in 1972, Cardiss Collins continued his legacy as a loyal politician in the Chicago Democratic organization directed by Mayor Richard Daley. One of only a handful of women to serve in Congress for more than 20 years, and the only black woman in the chamber for six years, Representative Collins evolved into a dedicated legislator who focused on the economic and social needs of her urban district. Cardiss Hortense Robertson was born on September 24, 1931, in St. Louis, Missouri, to Finley, a laborer, and Rosia Mae Robertson, a nurse. Upon graduating from the Detroit High School of Commerce in Michigan, she began work in a factory tying mattress springs while living with her maternal grandmother in Chicago. She later found employment as a stenographer at a carnival equipment company. Attending night classes at Northwestern University, she earned a business certificate in 1966 and a diploma in professional accounting one year later.1 After graduation, Cardiss Robertson remained in Chicago, where she worked for the Illinois department of labor as a secretary and later with the Illinois department of revenue as an auditor until her election to Congress. During her first term in Congress, Collins served on the Committee on Government Operations (later Government Reform and Oversight). As a member of the panel throughout her tenure in Congress, Collins chaired two Government Operations subcommittees: Manpower and Housing and Government Activities and Transportation. As chair of the latter subcommittee from 1983 to 1991, Collins worked to improve safety in air travel and fought for stricter controls on the transportation of toxic materials. She eventually rose to the position of Ranking Democrat of the full committee during the 104th Congress (1995–1997). Collins also served on the Committee on International Relations (later Foreign Affairs) from 1975 to 1980, the District of Columbia Committee during the 95th Congress (1977–1979), and the influential Committee on Energy and Commerce (later Commerce) from the 97th through the 104th Congresses (1981–1997), chairing the Commerce, Consumer Protection, and Competitiveness Subcommittee in the 102nd and the 103rd Congresses (1991–1995). Additionally, Collins was the first African American and woman selected as a Democratic Whip At–Large. Four years after taking office in 1973, Collins commented that her primary objective as a Representative was to "provide better living and working conditions for people [on Chicago's west side] and other low and moderate income people throughout the country." Known for her commitment to the issues directly affecting her constituents, Collins spent eight days each month in her district to ensure that she stayed abreast of their concerns.10 The close attention Collins paid to her district reaped benefits at the polls. For more than two decades, Collins won by comfortable margins in the strongly Democratic district, typically defeating her Republican opponents by more than 80 percent.11 Collins did, however, experience some difficult primary races during the mid–1980s (against Danny Davis, who later succeeded her)—a consequence of the decline in power of the Cook County Democratic organization that accelerated with the death of Richard Daley in 1976.12 She proved resilient without the influential machine that helped launch her congressional career; devoid of its strict control, Collins was able to develop as a politician and to pursue her own legislative interests. Throughout her 24 years in Congress, Collins dedicated herself to the advancement of African Americans and other minorities. According to Collins, some federal agencies, such as the National Endowment for the Humanities, the Federal Trade Commission, and the U.S. Justice Department, were not upholding the provisions of the Civil Rights Act requiring agencies that received federal funding to provide information on their affirmative action programs. Her 1985 findings as chair of the House Subcommittee on Government Activities and Transportation led her to ask Congress to curb funding to specific agencies, arguing, "Laws that have been debated and passed by the courts cannot arbitrarily be negated by individuals." In the 1980s, she continued her defense of affirmative action by drawing attention to the hiring practices of U.S. airlines, which rarely placed African Americans in professional positions.16 Representative Collins's push for equality in the aviation industry helped pave the way for an amendment to the Airport and Airway Safety, Capacity, and Expansion Act of 1987, requiring that 10 percent of all concession stands in airports be run by minority– and women–owned businesses. In an effort to promote equal opportunities for women in sports at colleges and universities, Collins introduced the Equality in Athletic Disclosure Act on February 17, 1993. The amendment to the Higher Education Act of 1965 directed colleges and universities to publicize the rate of program participation by gender. In recognition of her commitment to gender equity in athletics, Collins was inducted into the Women's Sports Hall of Fame in 1994.Collins also cosponsored the Universal Health Care Act and the Health Security Act in 1993 and urged the National Institutes of Health to focus on the health issues that concern minorities, since "little use has been made of studies on minority prone diseases despite the significant disproportionate array of health conditions." A longtime advocate of increasing breast cancer awareness, Collins drafted legislation to help elderly and disabled women receive Medicare coverage for mammograms and introduced a law designating October as National Breast Cancer Awareness Month. Collins declined to run for re–election to the 105th Congress (1997–1999). Vowing to remain active in Democratic politics, she nonetheless decided that the time had come to end her career in elective office. Collins cited age as a principal motivation for leaving office, telling reporters, "I'm going to be 65 next year, and that's the time many people retire." After the completion of her last term, she returned to Chicago, Illinois, and, later, moved to Alexandria, Virginia, where she died on February 3, 2013, at the age of 82. 1Marie Garrett, "Cardiss Collins," in Jessie Carney Smith, ed., Notable Black American Women (Detroit, MI: Gale Research, 2003): 204 (hereinafter referred to as NBAW). 3"Rep. George Collins (D–Ill.) Killed in Chicago Jet Crash," 10 December 1972, Washington Post: B4. 4Garrett, "Cardiss Collins," NBAW : 205. 5Joel Weisman, "Congressman's Widow Elected in His Place," 6 June 1973, Washington Post: A7. 6Leo M. Snowiss, "Congressional Recruitment and Representation," American Political Science Review 60 (1966): 628–629. 7"House Race Won By Widow," 18 April 1973, Washington Post: A22. 8"Widow Wins a Bid for Husband Seat," 18 April 1973, New York Times: 42; Andrew H. Malcolm, "Illinois Elects Its First Black Woman to Congress, on 92% of Vote," 7 June 1973, New York Times: 11; "Election Statistics, 1920 to Present," available at http://clerk.house.gov/member_info/election.aspx. 9Jacqueline Trescott, "The Coming Out of Cardiss Collins," 21 September 1979, Washington Post: C1. 11"Election Statistics, 1920 to Present," available at http://clerk.house.gov/member_info/election.aspx. 12Roger Biles, Richard J. Daley: Politics, Race and the Governing of Chicago (DeKalb: Northern Illinois University Press, 1995): 221–222, 232; Politics in America, 1994 (Washington, DC: Congressional QuarterlyPress, 1993): 474–475. 13Jacqueline Trescott and Elisabeth Bumiller, "The Raucous Caucus," 24 September 1979, Washington Post: B1. 14Trescott, "The Coming Out of Cardiss Collins." 15Politics in America, 1990 (Washington, DC: Congressional Quarterly Inc., 1989): 345. 16"Cardiss Collins," Contemporary Black Biography, Volume 10 (Farmington Hills, MI: Gale Group, 2002) (hereinafter referred to as CBB). See also CongressionalRecord, House, 99th Cong., 1st sess. (26 February 1985): E633. 17Congressional Record, House, 102nd Cong., 1st sess. (3 January 1991): E32. 18Karen Foerstel, Biographical Dictionary of Congressional Women (Westport, CT: Greenwood Press, 1999): 63; "Colleges Told to PublishSports Costs," 3 December 1995, New York Times: 37. 20"A Chicago Democrat is Quitting Congress," 9 November 1995, New York Times: B14. Oral History: In the National Visionary Leadership Project, 1997-2003, amount unknown. Interviewees include Cardiss Collins. Excerpts of the interviews are available online: http://209.213.221.46/nvlpmembertier/visionariest1/visionarypages/2003visionaries/collinscardiss/broadband.asp. Papers: In the Candidates for Public Office Campaign Materials, 1966-1976, 0.5 linear feet. Subjects include Cardiss Collins. Papers: In the Edith Spurlock Sampson Papers, ca. 1927-1979, 7 linear feet. Subjects include Cardiss Collins. Sound tape reel: 1984, 2 commercials on 1 sound tape reel. The commercials were used during Cardiss Collins's campaign for the 1984 U.S. congressional election in District 7 of Illinois, Democratic Party. "Cardiss Collins" in Black Americans in Congress, 1870-2007. Prepared under the direction of the Committee on House Administration by the Office of History & Preservation, U.S. House of Representatives. Washington: Government Printing Office, 2008. "Cardiss Collins" in Women in Congress, 1917-2006. Prepared under the direction of the Committee on House Administration by the Office of History & Preservation, U.S. House of Representatives. Washington: Government Printing Office, 2006.